I bet you’re laughing right now if you were around when it was built from 1975 and 1979. It was positioned by American Motors as “The first wide small car”. Also unique at the time, the passenger door was four inches (101 mm) longer than the driver’s. This made passenger loading easier, particularly from the rear seats. I had a 75 one, red with a white interior. I put a sunroof 0n it too and called mine “The Astrodome”. Its initial design idea was started in 1971. The car’s unusual rounded shape with massive glass area greatly contrasted with the three-box architecture with “square, boxy designs” incorporating upright grilles and slab-sides of the era. The Pacer was described as “the seventies answer to George Jetson’s mode of transportation” at a time when “Detroit was still rolling out boat-sized gas guzzlers. The large amount of glass led Car and Driver to dub it “The Flying Fishbowl”. 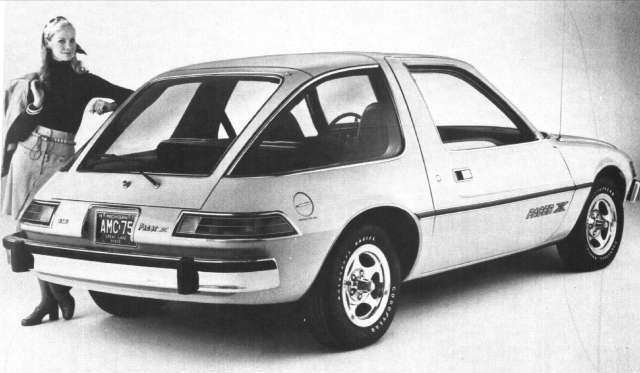 The Pacer’s “jellybean” body style is a readily recognized icon of the 1970s. 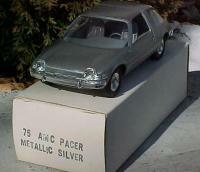 In its first year of production, the Pacer sold well, with 145,528 units. There was little competition from other American manufacturers, most of whom had been blindsided by the oil crisis. However, Pacer sales fell after the first two years, and it was available through the 1980 model year. Similar to its mid-year introduction, on December 3, 1979, production of the Pacer ended at the Kenosha, Wisconsin assembly plant where it had begun five years earlier.A total of 280,000 cars were built. Increasing competition from the Big Three U.S. automakers and the rapid consumer shift to imported cars during the late 1970s are cited as the reasons for this outcome. It has now become a collectible. OK, so now onto the promo model. It came in red, yellow and silver and only the 75 year. There were kits for the later years including the wagon. The promo model can be had anywhere from $30 all the way up to $75. Of course more with the box which was just a white box with the model and color stamped on it. OK, I’ll admit, it does look a little goofy but goofy in a fun way. I wish I could get mine back but most likely that has some and gone from the scrap yard.